Note: This is a repost from my other site. I am have a bunch of miles and points related things over there and plan to import it to Miles Points Reselling. During the last week of June, my wife and I dropped the kids of at grandma and grandpa’s and flew to Europe for a week. We flew into Brussels and out of Paris. Our flight got off to an interesting start with our 90 minute delay out of O’Hare. The result meant that we missed our connection in Madrid to get to Brussels so we ended up getting into Bruges around 7:00 PM instead of around 2:00 as originally intended. Oh, and us taking the local train to Bruges instead of the IC didn’t help either. However, once in Bruges we mostly had it to ourselves. Bruges gets a lot of day trippers so staying overnight there is terrific. Once 6:00 or 7:00 pm rolls around the streets are mostly empty. Before exploring the town, we of course had to get hydrated with some locally brewed beer. Bruges Zot. We then walked around town, and mostly had the town to ourselves. We spent a few hours walking around then ate a late dinner. After dinner the square was dark and the bell tower was lit up, it was even prettier in person. I have a rule for most towns I visit in Europe, climb the tower. 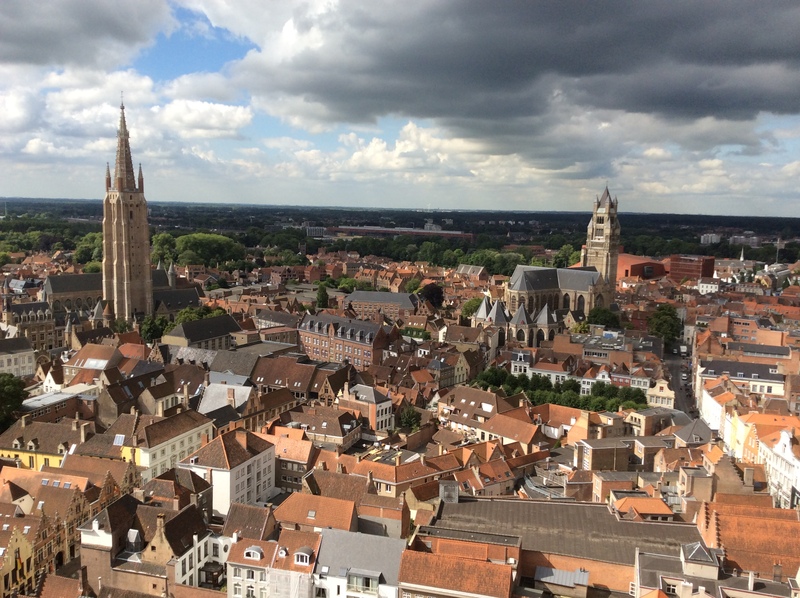 Bruges was no exception and here is the view. We continued walking around town and visited some of the highlights, including a Madonna and Child by De Vinci in St. Catherine’s Church (the one on the left above), the Basilica of the Holy Blood, and a tour of the local brewery. Bruges packs in a lot of great sightseeing for such a small town because back it it’s heyday it was the same size as London. It had the wealth to purchase masterpieces like the above. During the second crusade a local crusader allegedly brought back a vial of Christ’s blood which is housed in the Basilica of the Holy Blood. The picture above is the alter where the blood is stored. We continued on our walk after the Basilica. We finished our walk at De Halve Maan brewery and had a pre-tour beer. During our tour of the town we also had to enjoy a local delicacy. About the fries, they were spectacular. While I am pretty sure you can find fries at home that are cooked just as well (perfect I should add), I’m not convinced you can find mayo like that at home. Locals eat these with mayo and and I can see why. The mayo is so rich and creamy it is downright decadent. My one regret in Bruges was not eating more of these and possibly not staying an entire week. After exploring Bruges in the morning, we rented bikes in the afternoon to explore the outer edges and we took a 20 minute ride out the canal to Damme. It had a pretty cool ruined church. After the bike ride we returned to Bruges for dinner. Our original plan had been to stay in Brussels for 3 days and just day trip to Bruges. A friend suggested we spend two nights in Bruges. In hindsight, I was thankful for the advice. Bruges is a virtual ghost town in the evening. After all the day trippers leave Bruges is so peaceful. The entire city center is a Unesco World Heritage Sight and when you visit it is obvious why. It is one of the best preserved medieval towns in Europe. It is an amazing place to visit.